In order to understand how CALT courses are structured, it may be useful to present principles of a flexible syllabus. EAP courses are mostly based on some syllabi; the syllabi are usually based on needs analyses; and those needs analyses are often based on some research. Apart from organising interviews with or distributing questionnaires to academics, experts, graduate students, experienced EAP teachers, non-academic EAP users and others, syllabus developers can also communicate with students who are going to take a given course. The students can sit placement tests, fill in questionnaires or come for interviews, but that is usually all. Then, they wait for what is going to be prepared for them and come to class to see what kind of course has been developed. Sometimes, questions such as “What do you expect of this course?” or “What do you expect to learn?” are asked and discussed in the first session of the course but then happily ignored and forgotten in the second and other sessions because the syllabus already exists and does not change because of those expectations. The flexible syllabus changes this process and allows students to influence the content of their course actively. Topics, tasks and activities are developed within the framework of a syllabus in a traditional way before the course. Then, in the first session, students are engaged in an activity called “PRIORITIES”. This activity usually takes about 30-40 minutes. This example is described for a group of about 16 students, so the numbers of students in groups can change according to the number of the whole class. First, students are presented a list of all possible topics that have been prepared and can be covered in the course. Second, listed topics are discussed so that everybody understands what each means. Third, students have 1 minute to choose two priorities for the course. They should choose two topics they would like to focus on most and get ready to give reason for such choice. 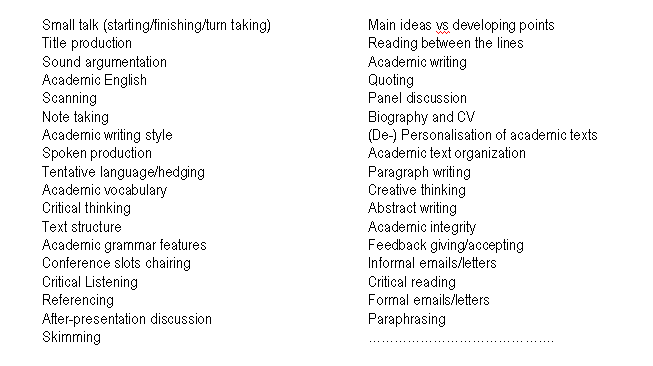 Apart from the listed topics, there is also one empty line, where students can write their own topic if they have one. Fourth, students are asked to form pairs and they are given 3 minutes to do the same task. Each pair should come up with two priorities for the course they agree on. The discussion in pairs can bring different results: (a) one original topic from each member of the pair; (b) two original topics from one member and no original topic from the other one; (c) one original topic from one member, one new topic from the list and no original topic from the other member; or (d) no original topics from either member of the pair and two new topics from the list. Fifth, the pairs are asked to join together and make groups of four. These groups are given 5 minutes to do the same task (choose two priorities for the group). Sixth, groups of four are asked join together and make groups of eight. These two groups are given 7 minutes to do the same task (choose two priorities for each group). Finally, the whole class together is given 10 minutes to choose two priorities for the course. The students are told that if they choose two priorities, the choice will be respected, if they do not come to any agreement, the teacher will choose for them. After-session activity: Students are asked to discuss their choice in an online discussion forum of the course. They should explain why they have chosen those particular topics and discuss what they could include. For students, this activity brings the opportunity to think more deeply about the choice and/or express their opinions they did not have chance to express in class. For teachers, it gives them an idea of the level of writing of the group; they can also see if there are students who are really unhappy about the choice of the group. - to choose focus of the course. d) topics and tasks in the course can be negotiated. 2) Teachers do not have to waste their time or bore students with something students already know or that is of little interest to the particular class, for example, and can focus on areas that are most useful to the class. 3) Teachers, while monitoring the activity, can get some idea of the group dynamics and of negotiating, language and other skills of individual students. 4) Teachers, when students´ activity declines later during the course, can remind students of the fact it has been their choice and, therefore, they should work accordingly. 3) finalise their syllabus after the first session of the course. Dear Libor, I have just used your "Priority" activity with my undergraduate freshers, students of English for Chemistry. They were provided with a 10 Unit online course and asked to choose 6 out of the 10 available topics. It worked very well, giving my students possibility to own their learning and me valuable feedback on their preferences. Thank you for sharing!